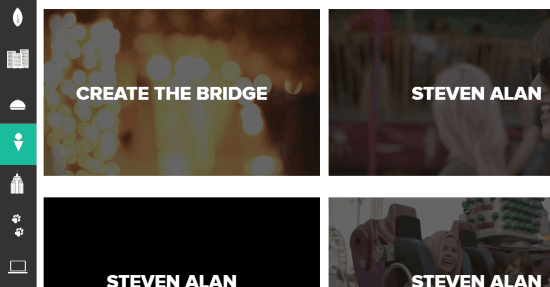 Here are 10 free websites to download free royalty free videos. They can be used to download hundreds of royalty free videos for free.Some of these websites let you use videos for Personal use only, while some let you use them for personal as well as commercial use. You also don’t need to give attribution or credit to the websites for downloading the free stock videos. The downloaded videos can be used for making animations, multimedia presentations, game intros, project demos, and whatever you want free of charge. Almost all these websites offer high-resolution videos, but some of them also offer 4K videos, motion FX, timelapse, etc. There are many websites which offer royalty free videos, but most of them are licensed under Creative Common Attribution 3.0 or Creative Common Attribution 4.0 license. That means if you want to download and use the royalty free videos, then you do have to give a credit back to the websites. But, the websites which I will explain in this post offer free royalty free videos and either follow the CC0 license or their own license without any restrictions. Note: Before you use video from any of these websites, make sure you completely check the license agreement to know what type of rights are associated with a video. Some websites might offer a video free for commercial use, but there might be some restrictions around what type of projects they can be used it. I have given link to License page wherever I could find, but make sure you do your own research before you decide to use a video. 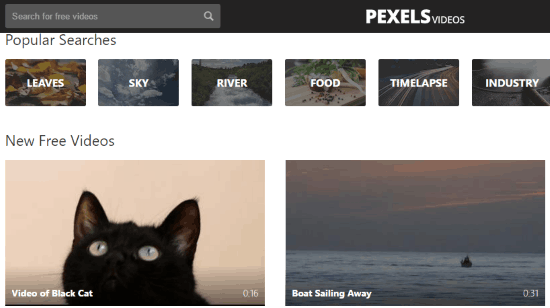 PexelsVideos is definitely one of the best websites to download royalty free videos for free. 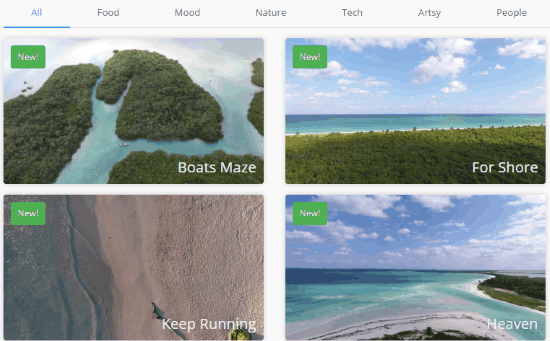 It offers tons of royalty free videos categorized into Leaves, Sky, River, Food, Timelapse, Tech, Animals, and more. You can download these videos without spending any money and also you don’t have to give attribution to the website. After downloading the videos, you can use them for personal or commercial projects as well. There is no limitation on the number of royalty free videos which you can download and use from this website. All the videos are of high-quality (including 4K resolution) and ideal for making stunning website intros, promotions, product demos, etc. The videos offered by this website comes with “CC0 license” which means you can edit or modify the videos in any way you want. You can read more about the license from here. Coverr is another useful website for downloading royalty free video without paying anything. It has a vast database of royalty free videos which are divided into various categories including Food, Mood, Nature, Tech, Artsy, People, Animated, etc. All these videos can be downloaded and used for non-commercial, educational, and commercial projects as well. The best part about this website is that you don’t need to give a credit to the website for downloading or using the videos. 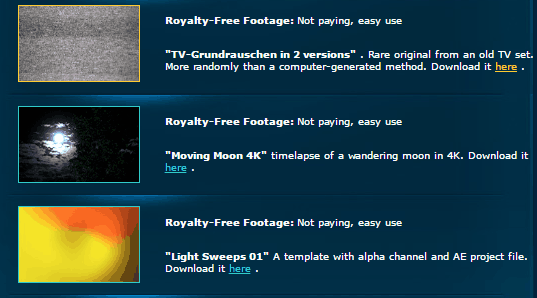 Pixabay is another website which has a huge collection of free royalty free videos. You can browse and download more than 2000 videos from this website for free. The videos are listed in multiple categories like Animals, Computer, Industry, religion, Education, Music, Science, Sports, People, and more. To download free videos, you don’t have to give attribution to the website or do any linking to the video source. 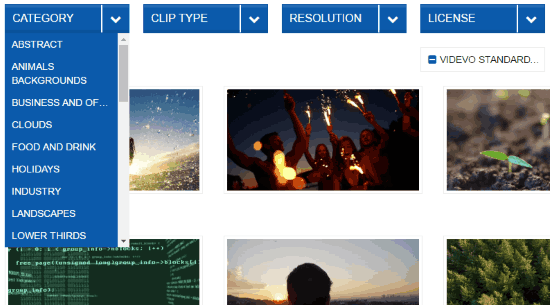 Similar to PexelsVideos, all the videos offered by Pixabay are high definition videos and some of them even come with 4K resolutions. Apart from downloading royalty free videos, you can also submit your own clips to this website and make them available for others to download. All the videos are released under “CC0 license”, which means they are completely free of copyrights and you can use them on your personal or commercial projects. You can read more about the terms and conditions for usage from here. Distill also comes with a decent collection of HD royalty free videos which you can download and use commercially as well. 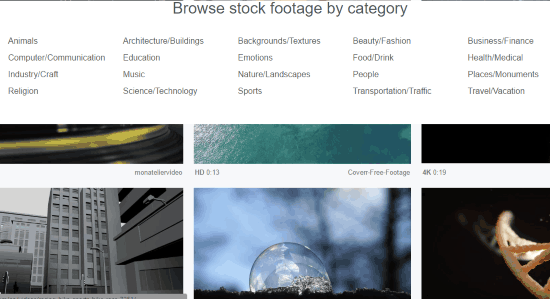 This website is actually in beta, but it does have a handful of stock videos for you to download and use without spending any money. The videos will be available under various categories named Nature, People, Architecture, Food, Technology, City, and Animal. You can copy, modify, and use all the videos without giving credits to the website or asking for permission. This website also offers the royalty free videos that are released under Creative Commons Zero (CC0) license. It doesn’t actually have a license page on the homepage, but you will be able to see the license details after you register and click on the “the Distill license” option under “My Account”. Life of Vids currently provides more than 250 high-definition royalty free videos which you can download and use for free. The only catch is that you have to first download the videos to your Vimeo account and then download them to your PC if you want. There are no separate categories for the videos, but I have noticed that the videos include Sea, Hills, City, Wild Life, and more. The best part is that every video is free of copyrights and you can use them without even mentioning the source website or giving an attribution. The downloaded videos can be used for personal, educational, governmental, as well as commercial use. Similar to Pixabay, it also lets you submit your own videos and make them royalty free for others to use around the world. Life of Vids also supports Creative Commons Zero license such that you can edit, copy, or modify the videos without any restrictions. You will be able to read about the license on the homepage itself. 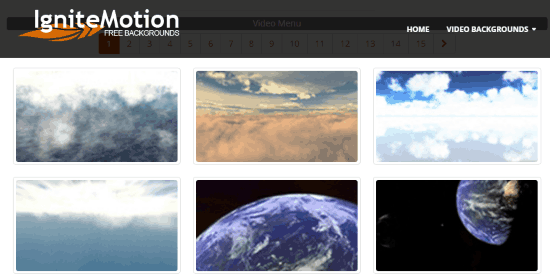 IgniteMotion also offers tons of royalty free video clips where most of them are video loops and animated backgrounds. The video clips will be visible under different categories like Clouds, Fire, Water, Energy, Speed, Gears, Abstract, and more. It lets you browse all the categories and then download all these videos without asking for permission or money. All the royalty free videos are high definition videos which you can use for your film, social media, or any other video projects. You can use the downloaded videos for your commercial or personal purposes and credits for the videos are not required. That means you don’t have to mention on your projects that you have downloaded the videos from “IgniteMotion”. If you would like to know more about the terms of usage, then read the full license instruction here. 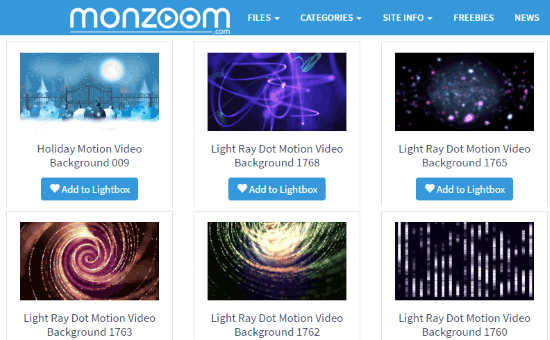 Monzoom is another interesting website which provides hundreds of high-quality royalty free videos which you can download and also use for free. 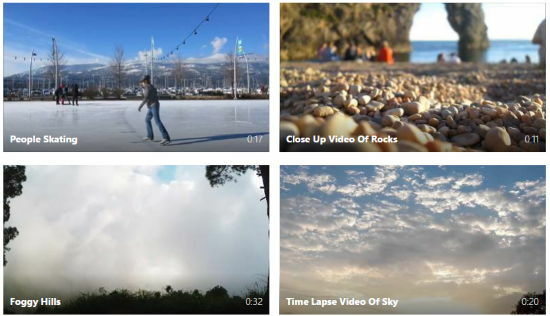 The video category includes Motion FX, Intros, Mattes, Revealers, Transitions, etc. Among all the royalty free videos, some are paid and some of them are completely free to download. You can browse the royalty free videos by clicking the “Royalty Free” menu option at the top. When you do that, you can filter out all the paid videos by selecting the “Free” filter option. All the free royalty free videos which you download from this website can be used commercially and non-commercially. The best thing is that you can download and use the videos without any need for attribution. If you would like to know more about the terms and conditions of usage, then you can check out the license from here. HD-Trainings is another free website that can be used to download royalty free videos. It comes with more than 200 videos which you can download and use for non-commercial and commercial purposes. 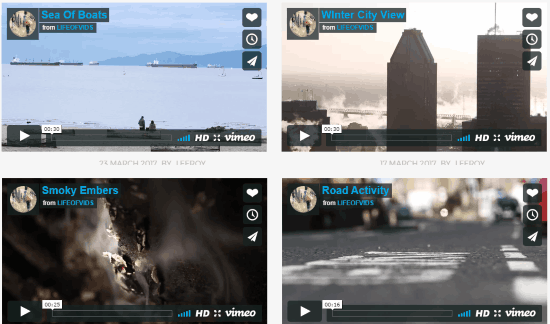 The videos include scenes of Nature, Urban Life, Sky, Animals, Road, Hills, and so on. Almost all the videos offered by this website come in high-resolution. There is no limit on how many videos you can download and use. Do note that, similar to “Life of Vids” you would need to add the videos to your Vimeo account first and then download them for usage. To download the royalty free videos from this website, it doesn’t require you to give credit to the website or pay any kind of fee. There is actually no separate page for the license, but you can read the terms of usage at the top of the download page. Videvo is also one of the best websites to download royalty free videos. It has a robust collection of high-quality royalty free videos which you download for free and use them for personal projects as well as commercial projects. The videos are scattered across categories like Abstract, Animals, Art, Clouds, Holidays, Landscapes, Space, Musical, and more. To download the videos, you need to register for a free account on Videvo. The videos are actually released under 3 separate licenses named, Videvo Standard License, Videvo Attribution License, and CC 3.0. All the videos which are available under the “Videvo Standard License” are completely free to download and use without even giving credit to the website or the author. You can check the terms and conditions from here. 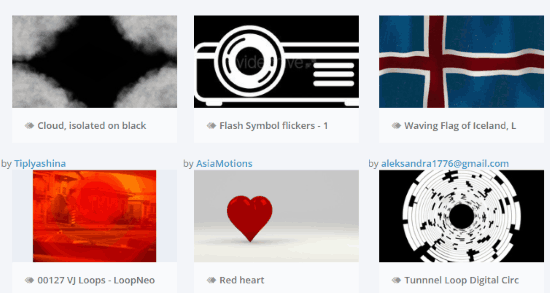 Motion Elements is another great source for downloading royalty free stock videos. It bundles over 400 videos for you to download for free. The above link will redirect you to the page where you will be able to download the videos for free on Motion Elements. Before that, it requires you to register for a free account of Motion Elements such that you can download up to 30 free royalty free videos per week. All the videos are in high-resolution formats like 720P HD, 4K, and so on. The videos are categorized into Business, Buildings, Animals, Military, Nature, People, etc. You can download the royalty free videos from this website and use them commercially as well. Using the videos doesn’t require you to give credit to Motion Elements, but there are some limitations on their usage such as you can’t use them for trademark, logos, etc. Read the full terms and condition here. If you’re searching for free websites to download royalty free videos, then these are some of the best websites to do the same. Personally, I like them all as the videos offered by these websites can be used for your personal and commercial use, without paying anything or giving credits. Before you use these websites, please ensure that you have read the license or terms of usage carefully.